Skylar’s floundering after the deceptions and betrayals uncovered in Unplugged (2016). She feels responsible for the evils unleashed upon society by her sister, Jude, and by the man who’s possibly her father—and she’s determined to save her best friend, one of the many slated to have the physical body sold off and to live exclusively in the digital world. But Skylar and Rain are on the rocks, and she feels distant from the resistance. 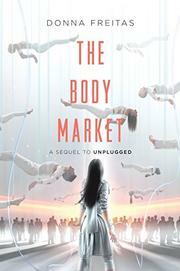 Doing reconnaissance at the Body Market, Skylar’s abducted by a hot bounty hunter named Kit. Trapped with him during a blizzard, she quickly learns his angst-y back story, and the two begin to fall for each other. Instead of turning Skylar over to Jude, Kit releases her. Back with the resistance, Skylar and Zeera pass out antique tablets for communication purposes, with hand-wave–y references to “the Wi-Fi” that connects them. In earnest expository dialogue, Skylar recollects history lessons about the devices “and all the division they caused between families and loved ones, all the anger and hurt feelings, all the obsession.” Cue a heavy-handed, instant tech obsession among the devices’ new users. Betrayals and twists enliven the ending to reel readers back in for the next installment. Though the lead is brown-skinned and the virtual world defaults to Caucasian 4.0, racial issues are not addressed.